Proxmox VE unifies your compute and storage systems, i.e. you can use the same physical nodes within a cluster for both computing (processing VMs and containers) and replicated storage. The traditional silos of compute and storage resources can be wrapped up into a single hyper-converged appliance. Separate storage networks (SANs) and connections via network attached storages (NAS) disappear. With the integration of Ceph, an open source software-defined storage platform, Proxmox VE has the ability to run and manage Ceph storage directly on the hypervisor nodes. 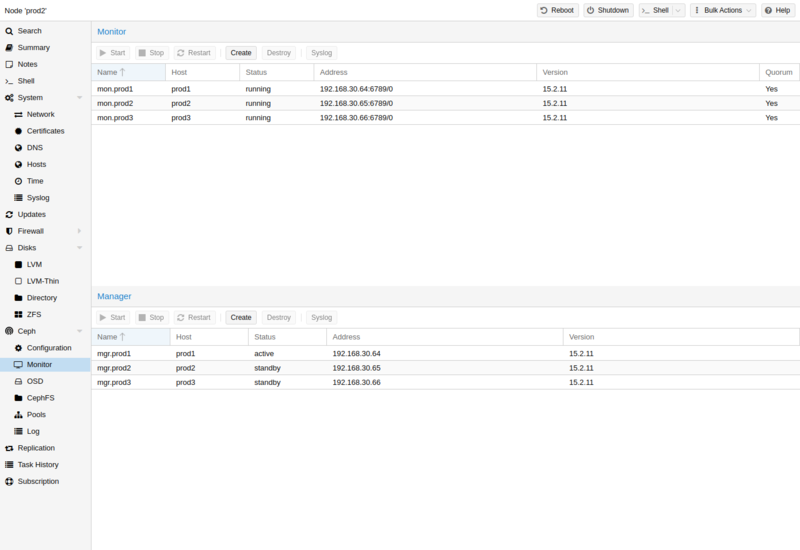 For small to mid sized deployments, it is possible to install a Ceph server for RADOS Block Devices (RBD) directly on your Proxmox VE cluster nodes, see Ceph RADOS Block Devices (RBD). Recent hardware has plenty of CPU power and RAM, so running storage services and VMs on the same node is possible. To simplify management, we provide pveceph - a tool to install and manage Ceph services on Proxmox VE nodes. To build a hyper-converged Proxmox + Ceph Cluster there should be at least three (preferably) identical servers for the setup. Check also the recommendations from Ceph’s website. Higher CPU core frequency reduce latency and should be preferred. As a simple rule of thumb, you should assign a CPU core (or thread) to each Ceph service to provide enough resources for stable and durable Ceph performance. Especially in a hyper-converged setup, the memory consumption needs to be carefully monitored. In addition to the intended workload from virtual machines and container, Ceph needs enough memory available to provide good and stable performance. As a rule of thumb, for roughly 1 TiB of data, 1 GiB of memory will be used by an OSD. OSD caching will use additional memory. is also an option if there are no 10 GbE switches available. The volume of traffic, especially during recovery, will interfere with other services on the same network and may even break the Proxmox VE cluster stack. Further, estimate your bandwidth needs. While one HDD might not saturate a 1 Gb link, multiple HDD OSDs per node can, and modern NVMe SSDs will even saturate 10 Gbps of bandwidth quickly. Deploying a network capable of even more bandwith will ensure that it isn’t your bottleneck and won’t be anytime soon, 25, 40 or even 100 GBps are possible. When planning the size of your Ceph cluster, it is important to take the recovery time into consideration. Especially with small clusters, the recovery might take long. It is recommended that you use SSDs instead of HDDs in small setups to reduce recovery time, minimizing the likelihood of a subsequent failure event during recovery. In general SSDs will provide more IOPs than spinning disks. This fact and the higher cost may make a class based separation of pools appealing. Another possibility to speedup OSDs is to use a faster disk as journal or DB/WAL device, see creating Ceph OSDs. If a faster disk is used for multiple OSDs, a proper balance between OSD and WAL / DB (or journal) disk must be selected, otherwise the faster disk becomes the bottleneck for all linked OSDs. Aside from the disk type, Ceph best performs with an even sized and distributed amount of disks per node. For example, 4 x 500 GB disks with in each node is better than a mixed setup with a single 1 TB and three 250 GB disk. One also need to balance OSD count and single OSD capacity. More capacity allows to increase storage density, but it also means that a single OSD failure forces ceph to recover more data at once. As Ceph handles data object redundancy and multiple parallel writes to disks (OSDs) on its own, using a RAID controller normally doesn’t improve performance or availability. On the contrary, Ceph is designed to handle whole disks on it’s own, without any abstraction in between. RAID controller are not designed for the Ceph use case and may complicate things and sometimes even reduce performance, as their write and caching algorithms may interfere with the ones from Ceph. Avoid RAID controller, use host bus adapter (HBA) instead. Above recommendations should be seen as a rough guidance for choosing hardware. Therefore, it is still essential to adapt it to your specific needs, test your setup and monitor health and performance continuously. 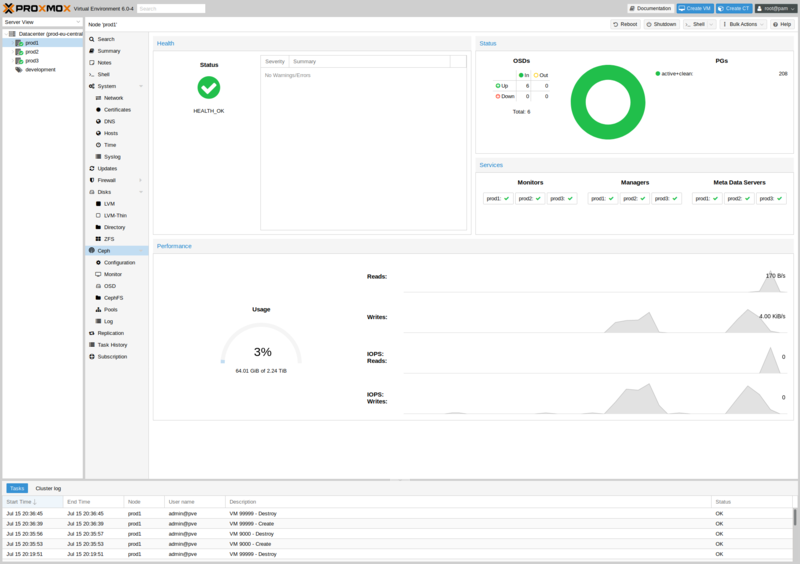 With Proxmox VE you have the benefit of an easy to use installation wizard for Ceph. Click on one of your cluster nodes and navigate to the Ceph section in the menu tree. If Ceph is not already installed you will be offered to do so now. The wizard is divided into different sections, where each needs to be finished successfully in order to use Ceph. After starting the installation the wizard will download and install all required packages from Proxmox VE’s ceph repository. After finishing the first step, you will need to create a configuration. This step is only needed once per cluster, as this configuration is distributed automatically to all remaining cluster members through Proxmox VE’s clustered configuration file system (pmxcfs). Public Network: You should setup a dedicated network for Ceph, this setting is required. Separating your Ceph traffic is highly recommended, because it could lead to troubles with other latency dependent services, e.g., cluster communication may decrease Ceph’s performance, if not done. Cluster Network: As an optional step you can go even further and separate the OSD replication & heartbeat traffic as well. This will relieve the public network and could lead to significant performance improvements especially in big clusters. You have two more options which are considered advanced and therefore should only changed if you are an expert. Minimum replicas: Defines the minimum number of required replicas for I/O to be marked as complete. Additionally you need to choose your first monitor node, this is required. That’s it, you should see a success page as the last step with further instructions on how to go on. You are now prepared to start using Ceph, even though you will need to create additional monitors, create some OSDs and at least one pool. The rest of this chapter will guide you on how to get the most out of your Proxmox VE based Ceph setup, this will include aforementioned and more like CephFS which is a very handy addition to your new Ceph cluster. This sets up an apt package repository in /etc/apt/sources.list.d/ceph.list and installs the required software. This creates an initial configuration at /etc/pve/ceph.conf with a dedicated network for ceph. That file is automatically distributed to all Proxmox VE nodes by using pmxcfs. The command also creates a symbolic link from /etc/ceph/ceph.conf pointing to that file. So you can simply run Ceph commands without the need to specify a configuration file. maintains a master copy of the cluster map. For high availability you need to have at least 3 monitors. One monitor will already be installed if you used the installation wizard. You wont need more than 3 monitors as long as your cluster is small to midsize, only really large clusters will need more than that. On each node where you want to place a monitor (three monitors are recommended), create it by using the Ceph → Monitor tab in the GUI or run. This will also install the needed Ceph Manager (ceph-mgr) by default. If you do not want to install a manager, specify the -exclude-manager option. daemon is required. 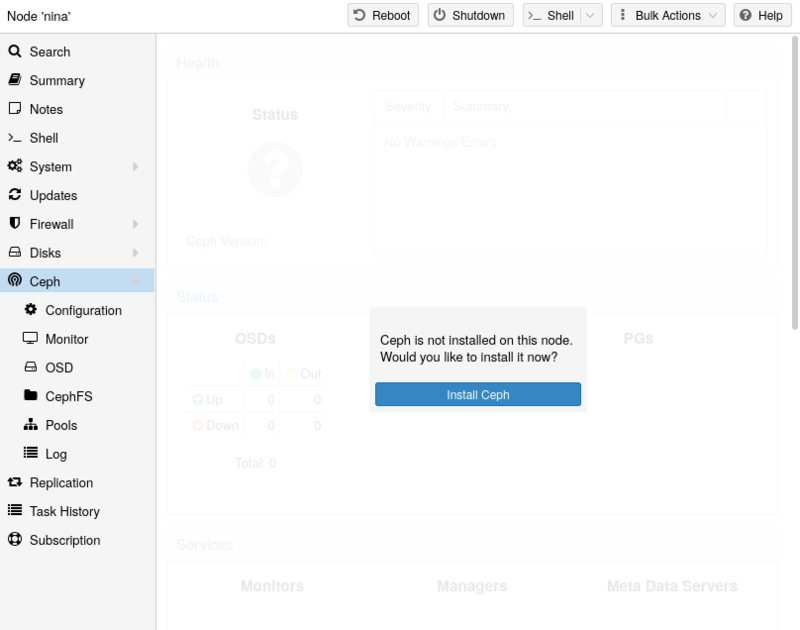 During monitor installation the ceph manager will be installed as well. 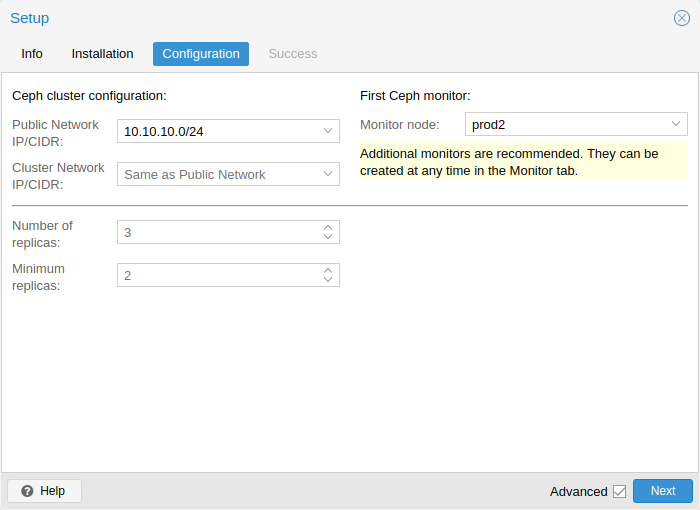 It is recommended to install the Ceph Manager on the monitor nodes. For high availability install more then one manager. We recommend a Ceph cluster size, starting with 12 OSDs, distributed evenly among your, at least three nodes (4 OSDs on each node). If the disk was used before (eg. ZFS/RAID/OSD), to remove partition table, boot sector and any OSD leftover the following commands should be sufficient. The above commands will destroy data on the disk!
. This is the default when creating OSDs in Ceph luminous. partition table. You can create this with gdisk /dev/sd(x). If there is no GPT, you cannot select the disk as DB/WAL. If you want to use a separate DB/WAL device for your OSDs, you can specify it through the -journal_dev option. The WAL is placed with the DB, if not specified separately. 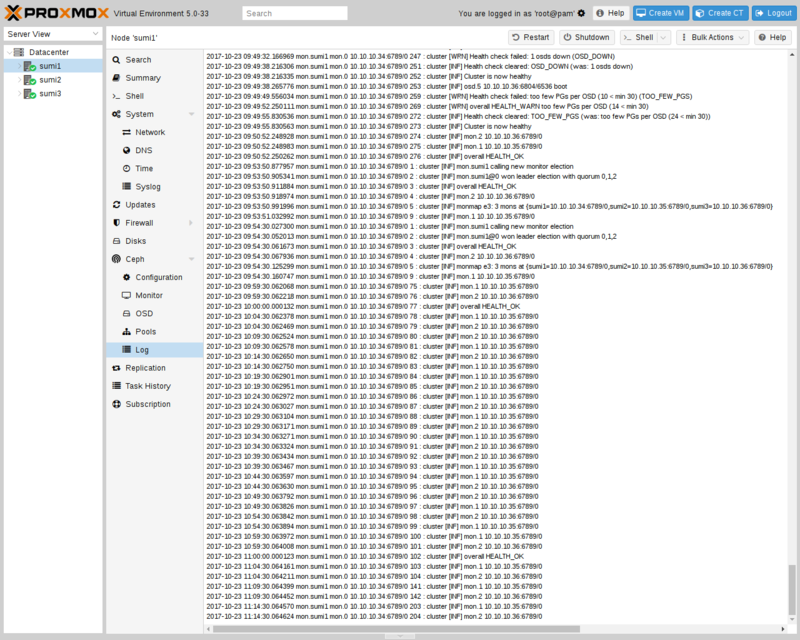 The DB stores BlueStore’s internal metadata and the WAL is BlueStore’s internal journal or write-ahead log. It is recommended to use a fast SSD or NVRAM for better performance. Till Ceph luminous, Filestore was used as storage type for Ceph OSDs. It can still be used and might give better performance in small setups, when backed by an NVMe SSD or similar. partition table. You can create this with gdisk /dev/sd(x). If there is no GPT, you cannot select the disk as journal. Currently the journal size is fixed to 5 GB. Example: Use /dev/sdf as data disk (4TB) and /dev/sdb is the dedicated SSD journal disk. This partitions the disk (data and journal partition), creates filesystems and starts the OSD, afterwards it is running and fully functional. You can create OSDs containing both journal and data partitions or you can place the journal on a dedicated SSD. Using a SSD journal disk is highly recommended to achieve good performance. A pool is a logical group for storing objects. It holds Placement Groups (PG, pg_num), a collection of objects. When no options are given, we set a default of 128 PGs, a size of 3 replicas and a min_size of 2 replicas for serving objects in a degraded state. The default number of PGs works for 2-5 disks. Ceph throws a HEALTH_WARNING if you have too few or too many PGs in your cluster. online. While PGs can be increased later on, they can never be decreased. You can create pools through command line or on the GUI on each PVE host under Ceph → Pools. If you would like to automatically get also a storage definition for your pool, active the checkbox "Add storages" on the GUI or use the command line option --add_storages on pool creation. CRUSH calculates where to store to and retrieve data from, this has the advantage that no central index service is needed. 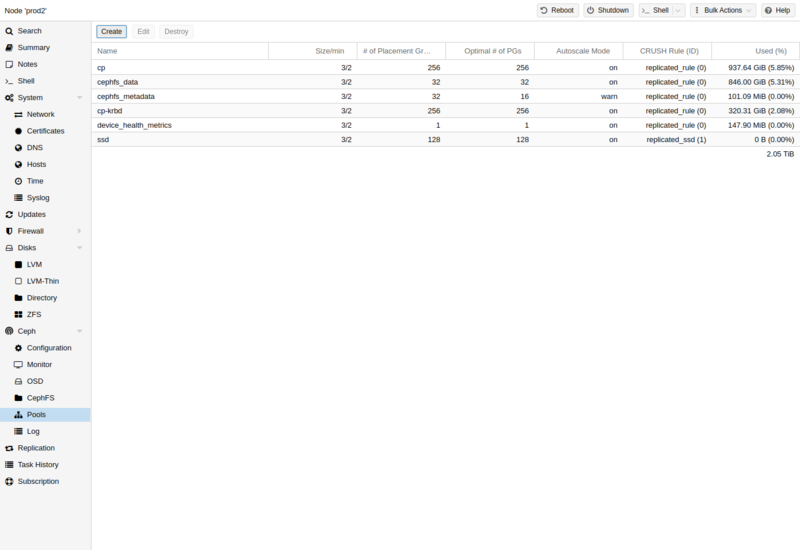 CRUSH works with a map of OSDs, buckets (device locations) and rulesets (data replication) for pools. This map can be altered to reflect different replication hierarchies. The object replicas can be separated (eg. failure domains), while maintaining the desired distribution. A common use case is to use different classes of disks for different Ceph pools. For this reason, Ceph introduced the device classes with luminous, to accommodate the need for easy ruleset generation. The device classes can be seen in the ceph osd tree output. These classes represent their own root bucket, which can be seen with the below command. To let a pool distribute its objects only on a specific device class, you need to create a ruleset with the specific class first. Once the rule is in the CRUSH map, you can tell a pool to use the ruleset. If the pool already contains objects, all of these have to be moved accordingly. Depending on your setup this may introduce a big performance hit on your cluster. As an alternative, you can create a new pool and move disks separately. You can then configure Proxmox VE to use such pools to store VM or Container images. Simply use the GUI too add a new RBD storage (see section Ceph RADOS Block Devices (RBD)). You also need to copy the keyring to a predefined location for a external Ceph cluster. If Ceph is installed on the Proxmox nodes itself, then this will be done automatically. Ceph provides also a filesystem running on top of the same object storage as RADOS block devices do. A Metadata Server (MDS) is used to map the RADOS backed objects to files and directories, allowing to provide a POSIX-compliant replicated filesystem. This allows one to have a clustered highly available shared filesystem in an easy way if ceph is already used. Its Metadata Servers guarantee that files get balanced out over the whole Ceph cluster, this way even high load will not overload a single host, which can be an issue with traditional shared filesystem approaches, like NFS, for example. Proxmox VE supports both, using an existing CephFS as storage to save backups, ISO files or container templates and creating a hyper-converged CephFS itself. in the ceph.conf respective MDS section. With this enabled, this specific MDS will always poll the active one, so that it can take over faster as it is in a warm state. But naturally, the active polling will cause some additional performance impact on your system and active MDS. Since Luminous (12.2.x) you can also have multiple active metadata servers running, but this is normally only useful for a high count on parallel clients, as else the MDS seldom is the bottleneck. If you want to set this up please refer to the ceph documentation. Install Ceph packages, if this was already done some time ago you might want to rerun it on an up to date system to ensure that also all CephFS related packages get installed.
. Additionally, the `--add-storage’ parameter will add the CephFS to the Proxmox VE storage configuration after it was created successfully. Destroying a CephFS will render all its data unusable, this cannot be undone! 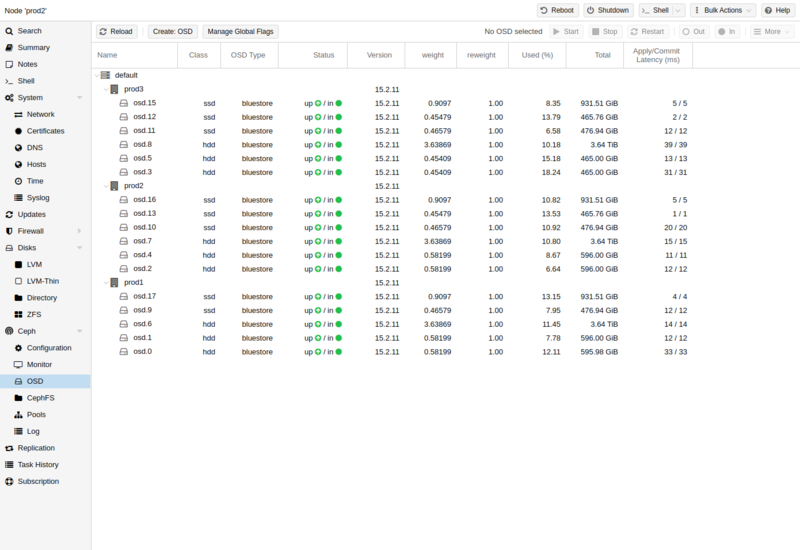 on each Proxmox VE node hosting a MDS daemon. 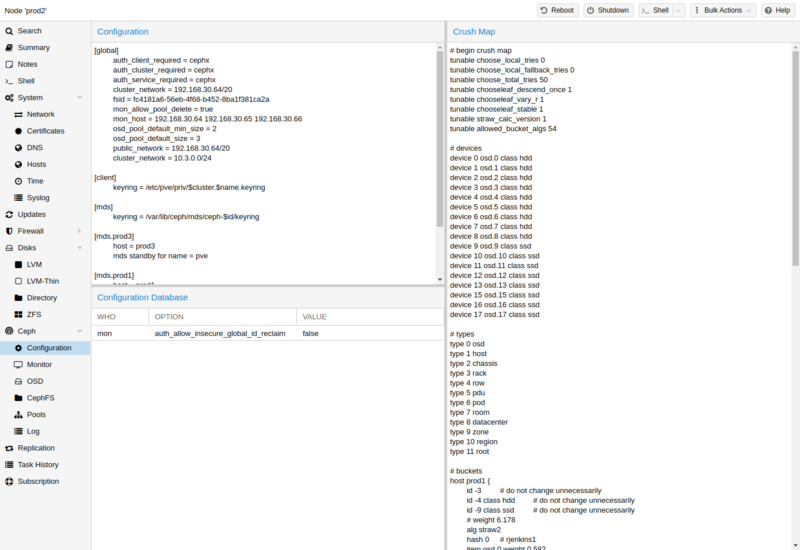 A good start is to continuosly monitor the ceph health from the start of initial deployment. Either through the ceph tools itself, but also by accessing the status through the Proxmox VE API. The following ceph commands below can be used to see if the cluster is healthy (HEALTH_OK), if there are warnings (HEALTH_WARN), or even errors (HEALTH_ERR). If the cluster is in an unhealthy state the status commands below will also give you an overview on the current events and actions take. a Ceph cluster on its website.